Do you leave what you think are very clear Spanish sub plans or French sub plans only to return to chaos the next day? The sub didn’t do any of the Spanish sub plans that you left, but just played games with the kids. The sub gave the wrong assignments to the wrong classes. The kids treated the sub badly (translation: tortured the sub) and didn’t do anything. You can’t find any of the work that the students were supposed to do and turn in. Your desk is a mess and you don’t know what happened to your supplies. The sub didn’t read the directions that you left. The sub didn’t pass out the papers that you left. The sub passed out the worksheets for next week’s classes instead of the ones that you clearly labeled sub plans. The sub couldn’t figure out how to use the projector, so the students didn’t do any of the assignments that you left. The sub couldn’t get onto the Internet so the students couldn’t do any of the assignments. 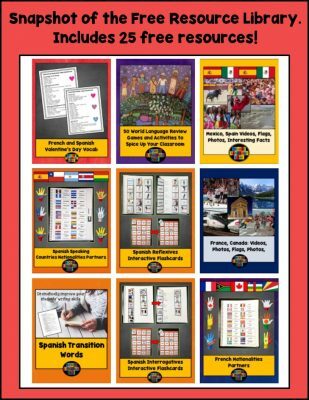 Want to know the secrets to ensure that your Spanish and French subs succeed with the lesson plans that you leave? Then this is the post for you, plus I’ll be sharing the forms that I fill out and leave for subs such as what to do with attendance, how to use classroom tech, what to do if a student misbehaves, etc. First, get yourself into the mindset of a substitute teacher. Remember what it was like when you were a first year teacher and didn’t really know what you were doing? Get in touch with that anxiousness that you feel going into the first day of the school year. You never know what your classes or your students will be like. Doesn’t know where you keep your remotes, pencils, scissors, tape, paper, etc. Pretty tricky, right? It’s no wonder that we return to a bit of chaos (ok, maybe a lot of chaos) the next day and that the sub has flubbed the perfect French and Spanish sub plans that we left. 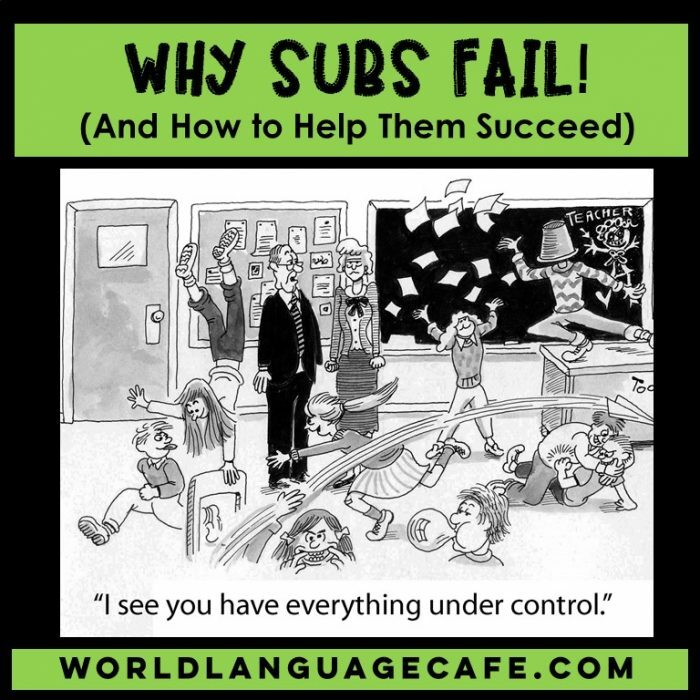 Disclaimer: Sometimes you really will get a horrible sub who will not get your students to do any work, no matter what you leave or how clear your instructions are. This sub may make actually cause chaos and problems in your class. Just expect this will happen every once in a while and fix things as best you can when you return. Be sure to let the school know so that they never hire this sub again. Copies of the bell schedule, emergency drill procedures, and any additional duties (study hall, cafeteria duty, etc. and what you need to do during those time periods). For example, during study hall, are students allowed to sign out to go to the library, computer center, or to another teacher for extra help? Do they need a pass to do this? Is your study hall a silent study or are they allowed to talk quietly? A copy of the school map with your classroom/s, bathrooms, copy room, and department center highlighted. Mark any places that you go during the day on the map. Color coding helps. A list of any student allergies or behavioral issues and how to address these if there are problems. Ex. What are some good strategies to use if the autistic student in your class gets anxious? Ex. What is the procedure if a student is misbehaving? Tech passwords, internet access codes, where remotes are located, and how to turn on any equipment. Leave the name and number/location of the tech person for the school and/or of a teacher who can help if your tech isn’t working properly (or the names of a few students in each class who may be helpful). Class Seating Charts!!! I subbed at a school where students could sit where they wanted and as a sub, it was a nightmare. I spent a whole ton of time trying to make my own seating charts for the week so I could learn the students’ names and kept reminding students to please sit in the same seats. Pro Tip: Highlight 1-2 helpful students in each class. Explanation of How to Take Attendance and What to Do with It. I know this sounds super basic, but as a sub, you have no clue what’s expected. Do I take attendance on paper? Do I need to turn it into an office? If so, where is the office and what time does it need to be there? Do I need to enter the attendance on the computer? If so,how do I access your account to do this? (See – it’s much more complicated than you’d think). Class Report Page. Leave a page for your sub to fill out to let you know how the day went and if there were any issues. Ask them to leave a contact number or email so you can get in touch if you have any questions. Your Cell Number or Email. I know this sounds simple, but wouldn’t it clear up a lot of things if the sub could just text or call you if they had questions during the day? Sounds like a lot of information to leave, right? 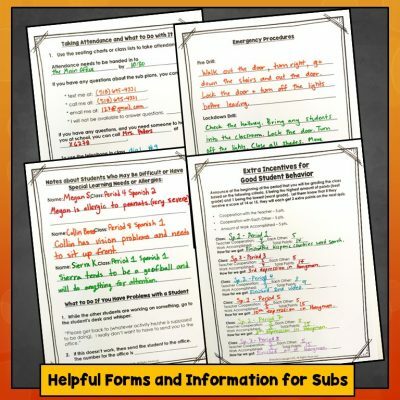 Save time by using these sub forms from my Free Resource Library. 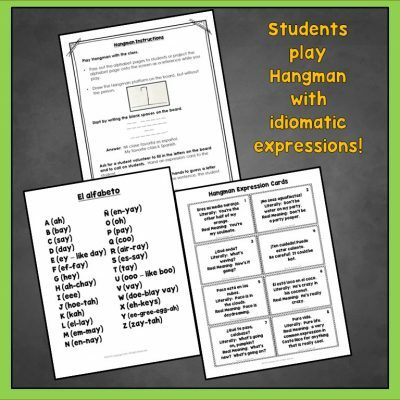 There are over 25 other free resources in the library – trust me – it will feel like you just won the teacher lottery! Post them on Google classroom in advance (if you have Chromebooks). Label them clearly by class. If possible, put each class’ work in a different colored folder along with seating charts, class lists, etc. Clear your desk and classroom surface areas of everything else, especially worksheets that you may want to use next week. Pretend you are leaving your desk unlocked in the parking lot at the mall. I’m not kidding!! Lock up or hide any valuables, candy stashes, scissors, tape, etc. 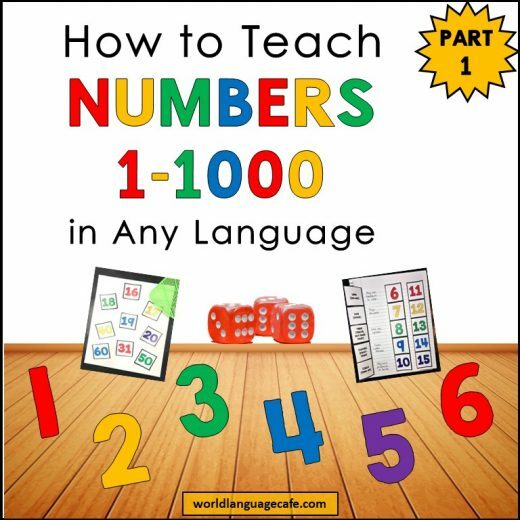 Plan for a sub who knows zero Spanish or French. Ask a teacher friend to check in with the sub during the day – this may help prevent problems. Be sure to leave enough work for your fast finishers. If you know you’ll be out in advance, tell your students exactly what they’ll be doing the next day and pass out all papers ahead of time. Tell them that even if the sub says something different, this is what you are expecting them to do. If you can, send your students the lesson plans through the Remind system. Leave a note at the top of your plans telling the sub that the students will be grading him/her on his/her performance as a sub that day and that the results will be reported to the main office. (OK – so this is fudging the truth a little bit, but who knows – it might just work). Whew! It’s a lot of work creating effective sub plans and instructions. 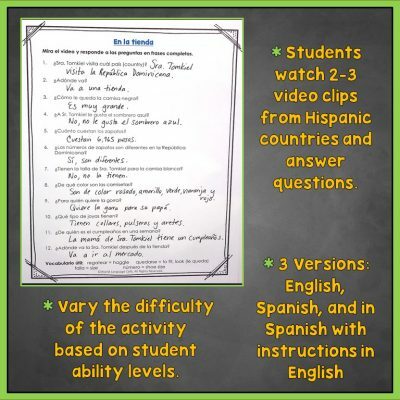 If you get tired just thinking about all this, check out some ready-made Spanish sub plans and French sub plans that you can email to your Department Head in a pinch. Want to hear the craziest horror stories about insane subs and the wacky things they’ve done in class? 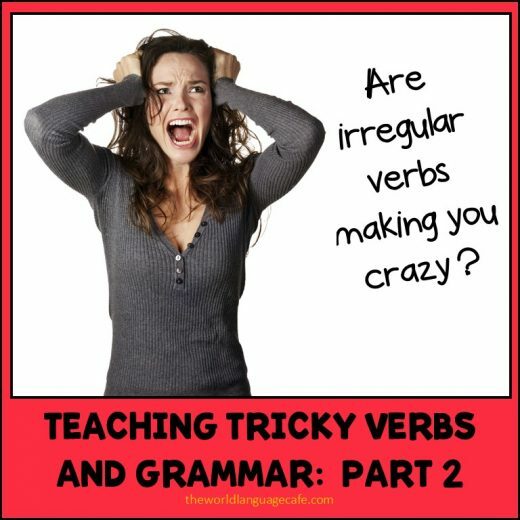 Check out this next post – you’ll be horrified and laughing out loud at the same time.